63 MEMBERS. 206 HOURS EXCHANGED. Watch this space for info about the next Potluck and New Member Orientation... to happen either late October or early November! 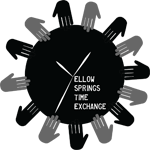 The Yellow Springs Time Exchange is a growing timebank. We'd love for you to join and help strengthen our increasingly resilient community. Click on "Become a Member!" and fill out the form and we will contact you. Equality: We are all equal. We all have gifts. We are equal and have strengths and something to contribute. No exceptions. Reciprocity: Exchanges can mutually benefit each other. Helping each other develops a self-reliant community and builds interdependence. Community: We need each other. Communities are stronger than individuals. People helping each other reweave communities of support, strength, & trust. Community is built upon nurturing roots, building trust, creating networks. Special relationships are built on commitment. Respect: Every human being matters. Respect underlies the values crucial for a community to thrive and for true interdependence. We each face individual challenges and have needs that we can help each other meet, and we must respect where each person is in the moment. The next Repair Cafe will be on Saturday, February 2, 2019, from 1-4 at the Anticoh Sculpture Annex; 910 Corry Street, behind the Foundry Theatre. Villagers can bring their small electronics, appliances, household wood items, and clothes to be repaired. This is a free event at which YSTE members and nonmembers can bring things that need fixing -- and keep them out of the garbage dump. Please let friends and neighbors know!